For most people owning a vehicle means being able to get to work, to school, to visit family and friends. 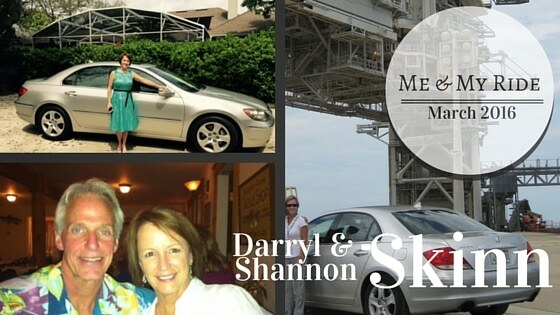 For Darryl and Shannon Skinn, owning a vehicle means being able to shower others with help and kindness. When Shannon first got her 2005 Acura RL in 2007, she was driving about 100 miles each day commuting to her job with NASA. Then, three years ago she was able to retire and spend that first year helping a dear friend battling cancer in Naples, Florida. Since then, she’s gotten involved with Florida Abolitionist, a local non-profit group fighting human trafficking in Orlando where she volunteers in a myriad of capacities, and she also volunteers through her church. When she’s not volunteering, she’s spending time with family and friends, helping plan her son’s June Alabama wedding, and running what she jokingly calls her “non-stop bed and breakfast” for out-of-state guests. Darryl’s work as a commodities trader allows him to work from home, but he also spends a lot of time flying to places like Chicago to conduct business. Between shuttling Darryl, family, and friends, Shannon gets even more miles in her Acura driving back and forth from the airport. When Darryl isn’t working, you may find this former farm boy in his 2001 Ford Explorer Sport making a trip to a home improvement store, hauling around supplies for yard work or other home repair projects. For this reason, he likes that his vehicle is sturdy and functional. However, when Darryl is out of town on business, you might still see this Ford trucking around town as he finds joy in loaning the vehicle to close family friends whose children are constantly going in opposite directions (this is why the vehicle is not pictured – it’s always out on loan!). This is one reason why he takes such good care of it – he doesn’t want it breaking down on someone else. But his diligent care is also rooted in his upbringing on the farm where one is simply taught to take good care of things, make them last, and get one’s money’s worth out of everything – a stance even city folks can live by. The Skinns vehicles are valuable to them because of the value they allow them to bring to others. Their friend, Leslie, knew this about them so she referred them to Marinelli Auto Service. It has been a great fit for the Skinns and for us. Shannon prefers to invest her money into the preventive maintenance of the vehicle rather than into repair, an outlook with which we agree completely. Running around by herself all the time in an older vehicle, Shannon’s concern is that it remains reliable; she doesn’t want to get stranded. Everyone needs to be cared for well – especially those, like Darryl and Shannon, who care so well for others. For this, we are honored to be able to serve them as they get the most out of their vehicles which, in turn, allows others to benefit from their unending kindness.